1996 Official Class Print "Dawn's Early Light"
USAFA 1997 Class Print: "Streamlined N' Rollin" SOLD OUT! 1983 "To Conquer the Air"
USAFA 2000 "United We Stand"
Some restrictions apply. Buyback is based on Current market value of the paper editions. 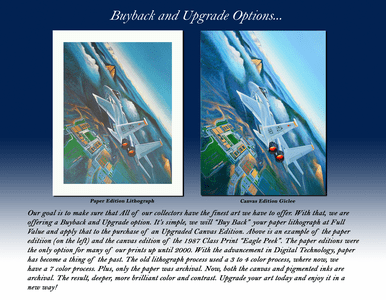 Max buyback is subject to availability of the art to be reproduced on canvas. Sold out editions are restricted to max $400.00 credit.